TheGardenLady received this question from LaNelle. You have named several pests/diseases of pyracantha: Mine suddenly have limbs dying in the middle of limbs/trunks. These are established bushes for privacy fence. How can I save them? 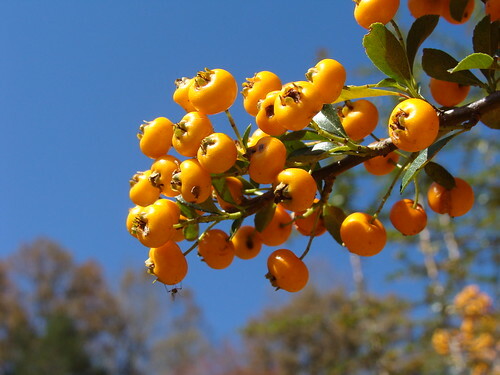 There are a number of different diseases of the pyracantha shrub. See here or here. One disease is called Fireblight. Fireblight is a systemic bacterial disease which is spread by aphids, bugs, birds and even the wind and rain. It can kill the plant. Fireblight is easily spread and can quickly spread from plant to plant. The disease is easy to spot. Affected leaves start to turn black and cracked as if they have been burnt by fire, giving it its name Fireblight. It causes the dieback of stems and leaves. Bacterial ooze often is associated with blighted tissues. Prune out diseased wood. In late summer or winter, prune out all diseased wood at least 10 to 15 inches below the infection and destroy. Disinfect pruners or tools between cuts by dipping in a 10% chlorine bleach solution. Oil tools after use. Avoid pruning in spring when bacterial ooze is prevalent. Also, clean up and dispose of any dead twigs and mummified fruit on the ground. These may harbor the bacteria. There is another common disease of the pyracantha shrub called scab. Pyracantha scab does not seem as serious as Fireblight but is very unsightly. Scab causes the blossoms and berries to turn black and appear scabby. It also causes the pyracantha to drop leaves and lose flowers and the berries become disfigured. There are a number of pests that attack pyracantha shrubs. These include, brown scale insects, aphids, leaf mining moths, caterpillars and whoolly aphids. Some of these pests also carry the diseases that kill the pyracantha shrubs. See here. There are also environmental disorders of the pyracantha that can affect the plant such as mineral deficiencies, nutrient and mineral excesses. You should check your soil for acidity. Pyracantha shrubs like a soil pH of 6.1 to 6.5 (mildly acidic). Avoid high nitrogen fertilizers. Your plants might also be suffering from poor water management. You should have the soil tested around the area where the pyracantha is planted to rule out some of the environmental disorders. If you think the plant may have a disease or an insect problem and you live in the United States, take a pruned branch with both the healthy and diseased part including leaves and any flowers or fruits on the branch to your local County Extension Agent or your Master Gardener office for them to accurately identify the problem and recommend chemical control if it is needed. Warning: Pyracantha thorns can cause reactions in humans. Wear leather gloves when handling and pruning. PS For anyone interested in planting new pyracantha shrubs in your yard, look for disease resistant varieties.